American Suzy Bannion (Jessica Harper) travels to Germany to enroll in Joan Bennett’s snooty ballet school. Run by Alida Valli, who looks like she might be hiding there to avoid prosecution for war crimes, the school seems to favor gossip and whispering over dance. Right away, things at the school go awry. Students die in ghastly ways, maggots appear, and Suzy passes out after a nasty dizzy spell…with blood. As she recuperates, Suzy starts to suspect the ballet academy serves as a front for a more nefarious institution. 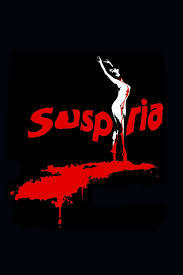 Dario Argento directed Suspiria and wrote the screenplay along with Daria Nicolodi and based it on Thomas De Quincey’s book. The spare dialogue and simple plot strewn with narrative distractions is just the canvas Argento uses to paint his story. If not for the appropriately jarring music by Goblin, you could easily turn off the sound and just watch this bizarre and colorful film. Don’t turn off the sound though. The soundtrack is amazing. Argento, cinematographer Luciano Tovoli, and production designer Guiseppe Bassan use richly hued sets and brightly-colored lights and lenses to paint each scene a different color. In one scene, Udo Kier wears a grass green blazer the identical shade as the building behind him. Douglas Sirk would be proud. Did you two plan this? I enjoyed Suspiria. While the acting is fine, but not special, the visuals paired with the Tubular Bells-ish music, and gruesome, creative deaths make it a blast to watch. The spooky Rosemary’s Baby atmosphere contributed to the mood of trippy paranoia. I’ve wanted to see this cult favorite for a long time and I’m glad I finally did. Sleepover in the redrum, I mean red room! I wrote this piece a few years ago, but saw the film at the Coolidge Corner Theatre just last night (October 17, 2017). If you get the chance, see this on the big screen with the Goblin tunes blaring. 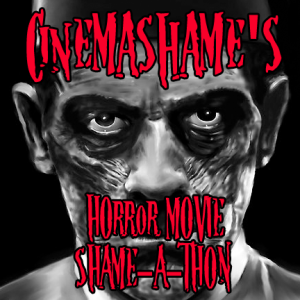 @cinemashame and @thirtyhertzrumble on twitter are also playing. Check out the other horror reviews on their sites. I’m @echidnabot on twitter.